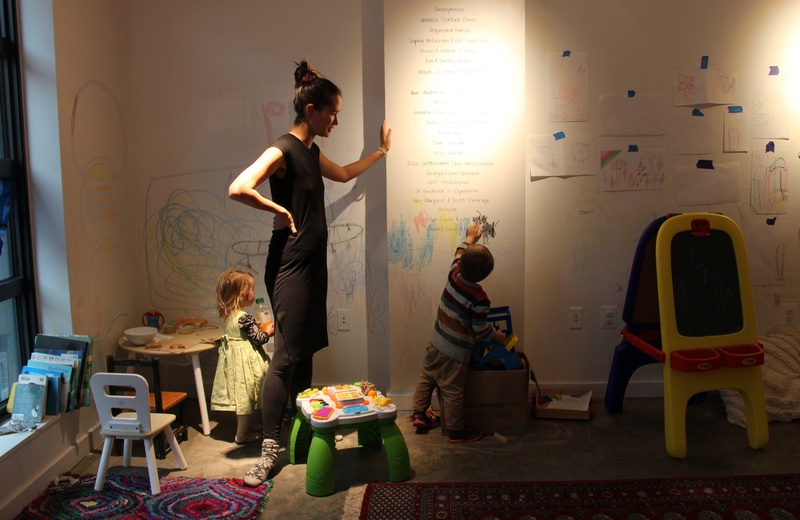 A Washington arts group is creating a space for artists mothering young children. The once-white walls of the Washington Project for the Arts in D.C.’s Shaw neighborhood are covered with crayon, paint and little fingerprints. Office furniture and supplies have been pushed aside to make room for bean bags, blankets, children’s books and a little wooden table and chair set. But that’s just one side of the office space. On the other side, behind a dividing curtain, three mothers are hard at work creating art. This is Artist Mother Studio, a nine-week-long experimental artists’ residency that comes to an end on Nov. 17. The program provided three women artists with a remarkable string of benefits, including studio space, childcare and a sense of community in the heart of D.C.
Anne Smith holds her daughter, Kiko, in the company of fellow artist Leah Lewis. Braden modeled the program off of a similar residency in Amsterdam, Mother in Arts, that took place last year. In the first iteration of the D.C. project this past spring, she and two other women artists would drop off their kids at a daycare provider’s house each day and then work out of studio space at Rhizome in Takoma Park, D.C.
Then, with about $20,000 of funding from the DC Commission on the Arts and Humanities, the Washington Project for the Arts and individuals donors, she started a second iteration this fall. Anne Smith works with charcoal and pencils in her studio. The charcoal dust wouldn’t be healthy for her infant daughter, she says. The half-dozen Washington Project for the Arts staff members agreed to work at a communal table for the length of the program so that their office and gallery space could serve three artists and their combined four children. A daycare provider, Dani Simms, takes care of the children from 11:30 a.m. to 2:30 p.m. each day. That’s a huge plus for any artist, but particularly ones in the District. According to Child Care Aware of America, center-based care for a single child in D.C. can cost more than $23,000 a year — one of the highest rates in the country. That amounts to about 35 percent of a median D.C. family’s income. All three of the artists in the program — Anne Smith, Leah Lewis, and Katherine Mann — said that while they each have supportive and involved partners, they’re the ones who typically handle the bulk of childcare. Lewis’s fiance is also an artist, and because he brings in more money than she does, she ends up spending more time caring for their three-year-old son, Biko. She makes art in her living room or kitchen whenever she finds the time. After a few hours in the studio, artist Katherine Mann crossed the curtain divide to play with her son and daughter. Mann used to rent her own studio space, but gave it up once she had her second child. Smith is a new mom, and her four-month-old daughter Kiko still breastfeeds. Smith rents studio space in Mount Rainer, Maryland, but she doesn’t like the baby to be too close to some of her materials, like charcoal dust. The setup in Shaw allows her to be close to Kiko throughout the day while still having enough space to do her work. Mann and her daughter share a quiet moment in the studio. While the program has been a success from the perspective of the artists, it’s time-intensive for Braden and space-intensive for the Washington Project for the Arts, which sees itself as just a temporary incubator for ideas like Braden’s. Braden plans to take the next few months to create a shareable template for the program and brainstorm how to scale it. She isn’t aware of any other programs like this in D.C. or in the rest of the country. But she thinks the demand is out there. Title image: Katherine Mann, right, works in her studio space at Artist Mother Studio, while her daughter Mae, 1, keeps her company. At left is artist Leah Lewis.